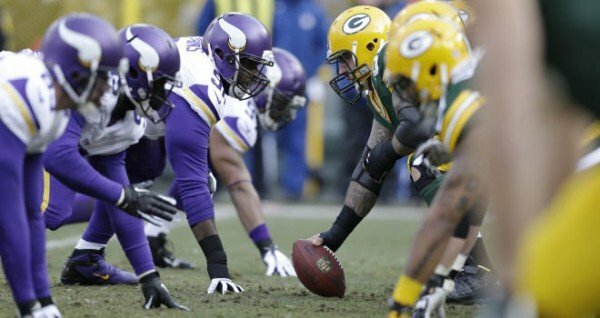 The Vikings will square off with the Green Bay Packers during a Thursday night primetime matchup. Daniel House breaks down five areas of emphasis to watch for during tonight's game. The Vikings are traveling to Lambeau Field to take on the Green Bay Packers during Thursday Night Football. A short week, combined with an injured quarterback, adds an interesting element to how the game will unfold. Nonetheless, the Vikings are looking to build upon a solid 41-28 win over the Falcons last week. It is unknown whether quarterback Teddy Bridgewater will play in tonight's game, after suffering an ankle sprain last week. Multiple reports indicate he is doubtful, but he is listed as questionable on the team injury report. The Vikings offense accumulated 317 yards passing, paired with an additional 241 on the ground last week. This was the type of balanced attack that offensive coordinator Norv Turner was searching for over the previous two games. Rookie running back Jerick McKinnon saw his first extended action and rushed for over 135 yards, while Matt Asiata added three goal-line touchdowns. The weather forecast indicates rain will fall for the entire game. If this is the case, both teams will be heavily hitting the ground game to move the ball up the field. After dropping losses to Seattle and Detroit, while nearly losing a matchup with the Jets, the Packers finally added a convincing win last week. They traveled to Chicago in a must-win situation and managed to roll for a 38-17 win. They forced two Jay Cutler interceptions and Aaron Rodgers relaxed Packers fans, throwing for over 300 yards and four touchdowns. The Packers distribute the ball to a plethora of receivers and with precision Rodgers can provide, the Vikings secondary will be faced with a challenge tonight. What will it take for the Vikings to pick up a win in Border Battle 1.0? What will happen at quarterback? As I discussed, Teddy Bridgewater is listed as questionable on the injury report, but reports are indicating he may be doubtful to play. In the event Teddy isn't ready, the coaching staff will hand the reigns to Christian Ponder. Many eyes bulge at the thought of Christian Ponder taking snaps for the team at quarterback again this season. With the weather forecast being poor and the heightened risk for Teddy to injure his ankle worse, the coaching staff could play the precautionary card. Bridgewater would have more time to heal and could be 100% ready for the next stretch of games. It seems unlikely that the team would enter the game with just one healthy quarterback, so in the event Teddy isn't going to play, McLeod Bethel-Thompson would likely be activated from the practice squad by the 3 p.m. deadline. If Teddy plays, look for the Vikings to establish the run and hit on the timely passes that will be presented vertically up the field. In the event Christian Ponder plays, I expect the team to continually use read-option and zone looks to emphasize short passes and more running calls. No team has allowed more rushing yards (704) to opposing running backs than the Green Bay Packers defense. The goal for the Vikings offense will be to establish the run and exploit this weakness. With a rainy forecast in play, the emphasis for both teams will be shifted to running the ball early and often. Jerick McKinnon can provide a change-of-pace, while Matt Asiata can gain the tough yardage to move the chains. The Packers defense will need to show they can handle the run, while being ready for some of the read-option looks Norv Turner will throw at them. If the Vikings can establish the run early, they will be able to open up the playbook to pass the ball, when the conditions are formidable to do so. How will Mike Zimmer attack Aaron Rodgers? When Aaron Rodgers is provided with adequate time, he can be one of the most deadly quarterbacks in the league. He has always had a history of destroying the Vikings through the air, especially when he slips away from pressure and has time to find receivers down the field. Mike Zimmer will dialing up packages to pressure Rodgers and it will be interesting to see how he exploits a weak Packers offensive line. Zimmer has a history of causing headaches for Rodgers and his passer rating significantly dropped to an average of 73.5 in two losses during games against Cincinnati. Don't be surprised to see some exotic packages that involve disguises and different looks where Anthony Barr and others are sent to pressure Rodgers. Can the secondary handle Nelson and Cobb? The Packers have several dual-threat receivers that are liaisons for Aaron Rodgers in the passing game. Jordy Nelson is one of the most underrated receivers in the league. His ability to make tough catches near the sidelines ranks him among the best in the league. He is the receiver Rodgers will turn to when he needs to convert a big first down. Randall Cobb is a red zone target and can add some flair in the way the Packers offense operates. Both of these receivers are very physical and will challenge the Vikings in man coverage tonight. Xavier Rhodes will be squared off with Jordy Nelson and Captain Munnerlyn will need to perform much better to handle Randall Cobb in the slot. If the secondary can't cover and the defensive line is unable to pressure Rodgers, the stats will pile up quickly in favor of the Green Bay Packers. The Vikings defense did not perform well and allowed the Falcons offense to convert on four third-and-long situations last week. Matt Ryan found the soft zone of the secondary and the defensive line wasn't able to close on sacks, putting a heavy strain on the defensive backs. If the Packers are placed in third-and-long situations, the Vikings need to get off the field, in an effort to prevent Aaron Rodgers from having too many chances to make plays. When Rodgers has time and is able to drift out of the pocket, he will shred opposing defenses. The Vikings need to control the clock and when they can get off the field, they need to keep the ball out of the hands of the Packers offense.